After an extensive national search, the Board of Directors of ATLIS is thrilled to announce the appointment of Christina Lewellen as its new executive director effective June 3, 2019. Christina’s proven track record of leading associations to the next level along with her passion for what ATLIS will become in the future make this an exciting time for the association as it embarks on a new period of growth with a dynamic, energetic and charismatic new leader. The Board’s confidence in Christina’s ability to lead ATLIS is evident in our unanimous support of her appointment as the next executive director. The comprehensive search began in November 2018, and we were humbled by the number of exemplary leaders across the nation who applied for this position. Christina stood out from the other candidates as a proven strategic association leader. Her experience in growing organizations and expanding member opportunities are exactly why she is the right person to shepherd ATLIS through its next stages of growth and development. As ATLIS continues to develop into the leading organization for technology leaders in independent schools we are excited to have Christina at the helm. Christina is a Certified Association Executive (CAE) from the American Society of Association Executives and holds an MBA from the Rochester Institute of Technology. Under her leadership as the Vice President of Business Development at the Association of Proposal Management Professionals, the organization significantly expanded its membership and professional development programs while doubling annual revenue. 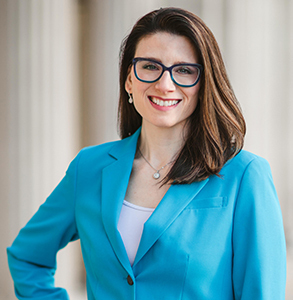 During Christina’s tenure as the Senior Director of Marketing, Communications, and Membership for the National Court Reporters Association, the organization became nationally recognized as a result of her front page features in the Wall Street Journal and work with other well-known media outlets. Christina will bring these experiences and successes to ATLIS. We are confident Christina’s knowledge and ability to work alongside our exceptional staff will lead to an expansion of our member base nationally and internationally while expanding our high-caliber professional development opportunities. She will be instrumental in cementing our organization as the one and only professional association serving independent school technology teams. Originally from a small town in western New York, Christina now resides in Winchester, Virginia with her husband and their four teenage daughters. In her free time, Christina enjoys singing in barbershop quartets, a hobby she shares with her husband, father, mother, sister, and daughters. She served two years as the president of Harmony, Inc. and continues to proudly serve on its board as the vice president of finance. We would like to thank Gabriel Lucas of Educational Technology Recruiting for his expert guidance and support throughout the search process as well as the entire search committee -- Tye Campbell, Kevin McAllister, Jeffrey Morrison, and Denise Musselwhite -- for their thorough research, diligent interviewing, and numerous hours dedicated to this important and critical process. We look forward to formally introducing Christina to our community during the ATLIS 2019 Annual Conference held April 14-17, 2019 in Dallas, Texas. ATLIS is pleased to announce the release of the opportunity statement for its next Executive Director. The Executive Director is the key management leader of ATLIS and is responsible for developing and articulating a clear, strategic vision and plan for the organization. The ATLIS Board seeks a visionary leader of high integrity and character who can shepherd ATLIS through its next stage of growth. Cover letter introducing yourself to the ATLIS search committee. A list of at least four professional references including each person’s name, organization, title, phone number, email, and relationship with you. Note: References will not be contacted without obtaining applicant's permission first. A three-year roadmap for how you would move ATLIS from a startup mentality to a mature professional organization. Include one strategic initiative you have led and how the lessons from that experience would be relevant to you in this role. ATLIS is partnering with Educational Technology Recruiting and Gabriel Lucas to conduct the search for the next ATLIS Executive Director. An opportunity statement, including the search timeline, will be published on Tuesday, November 27, 2018. Nominations for this extraordinary leadership opportunity from individuals or on behalf of others are encouraged using the information below. All nominations and applications will remain confidential. The search for a new executive director will begin later this year. RALEIGH, North Carolina – November 10, 2018 – The Association of Technology Leaders in Independent Schools (ATLIS) announces the departure of executive director Sarah Hanawald on November 15, 2018. Having built a nascent organization into a sustainable and thriving professional association, Hanawald is leaving to pursue other professional opportunities. Hanawald, who has been with ATLIS since 2015, has been a key member in launching the organization and its team, from doubling the growth of the annual conference and nurturing new relationships, to developing the popular ECATD (Early Careers and Aspiring Technology Directors) program, which is a pivotal professional development program for its membership. A search committee for a new executive director, chaired by board member Jennifer Carey, has been formed. Details of the search will be forthcoming. The Association of Technology Leaders in Independent Schools (ATLIS) is a national professional association offering targeted professional development, an already-celebrated mentorship program, resources and networking for members and the extended community. Founded in 2014, the ATLIS community now includes over 175 member schools seeking to share knowledge and resources with colleagues throughout the US. In the coming years, ATLIS aims to become a nationally accredited organization and continue building its community as the premier professional organization for technology directors.